Click to expand. And here are three lessons for the road. 1) The green landscape is what happens if, basically, we do nothing (i.e. 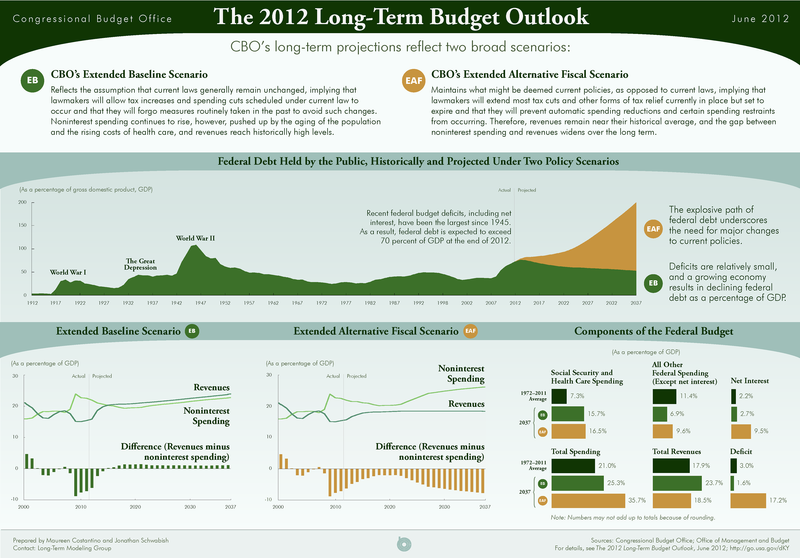 : the Bush/Obama tax cuts expire, the doc fix is in, the $1.2 trillion in spending cuts go into effect). The orange slope is what happens if Congress does just enough to keep taxes low and spending near current levels across the military, the discretionary budget, and entitlements. In the green scenario, deficits fall to 1.6% of GDP by 2037. In the orange scenario, they rise to 17% of GDP -- nearly equal to projected revenue in 2037. The cost of doing nothing, it turns out, is worth about 15% of GDP! 2) Direct your attention to the bottom right corner of the graph. In both the green and orange scenarios, all non-interest federal spending except Social Security and health care will fall 20% from its 1972-2011 average. With the retirement of the Boomers and the rising cost of medical care, government is ever-increasingly in the business of annuities and medical insurance. 3) Remember that this is all a big wild guess. The CBO has some of the smartest budget guys around. But even the smartest budget guys around can't predict the future. In 1998, we were projected to have a troublesome surplus through the 2000s. Today, we're projected to have a troublesome deficit through forever. Every budget graph comes with an invisible warning label: Circumstances may change.